I have a strong love (and bias) for Santa Barbara County Pinot Noir. Many bottles of Sanford, Whitcraft, Cambria, Au Bon Climat, Melville, and Lane Tanner have happily passed through our possession since the early 1990’s, and for years, Sanford’s “Sanford & Benedict” release was for me the benchmark bottling for its depth of flavor and year-to-year consistent excellence. 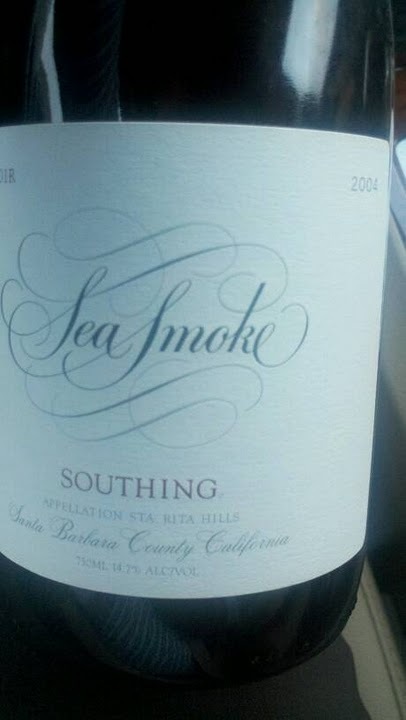 Then, Christie Bishop, friend and fellow blogger, introduced me to Sea Smoke and as they say, the rest is history. Don’t get me wrong; I still love “Sanford & Benedict” and I drink more Sanford Pinot Noir than any other label, but Sea Smoke is now the quintessential example of this great varietal in my book. A few weeks ago, we uncorked a bottle of ’04 “Southing” that we had kept for a while and, well, for lack of a better word . . . WOW. Excellent but slightly restrained on the nose, this wine really hits the palate with full flavor, lush fruit and spice, with a distinctive Sta. Rita Hills earthiness that lingered for a wonderfully long time. I might have expected this from a new release, but not from a bottle of pinot that had been laying down for five years and then decanted for 20 minutes. This was easily the biggest pinot noir I’ve ever tasted, and could have easily stayed in the cellar for another three years or more and would still hold up beautifully. We brought the bottle along to Hatfield’s and as expected, it was a perfect match for Quinn Hatfield’s perfectly composed (if perhaps slightly repetitive) seven-course tasting menu. It’s usually tough to find one decent bottle of Brunello for under $60, but our friends at Costco kindly decided to sell two bottles for under $40. We brought them with us to the Hollywood Bowl for the Rodrigo y Gabriela concert, and opened the D’Aquino first: a bit tight at first, it eventually opened up enough to reveal a somewhat dryer flavor than your typical Brunello, while still having a nice long finish. The Barbi was more fruit-forward and was the preferred choice between the two. While neither was mind blowing, both were excellent, enjoyable, and great values. Whenever we go up to Napa and Sonoma, we try to mix in old favorites with new and different places which haven’t previously visited. Domaine Carneros is one of the few places that we consider “required reading” whenever we’re in the area, both for the awesome setting, the excellent sit-down tasting experience, and most of all, the great sparkling wine. A few years back, Domaine Carneros decided to limit the release and raise the prices of their wines. Their flagship “Le Rêve” used to be readily available in our favorite wine store, but is now only available in restaurants and direct from the winery, so these winery visits have become an increasingly rare opportunity to taste it. On this visit, they happened to be tasting their very limited Late Disgorged “Le Rêve,” supposedly only available through their club and at the winery. Was it wonderful? Absolutely. Was it better than their regular release of “Le Rêve?” I thought so. Did I think it was worth the $100+ club-discounted asking price? No. Roederer Estate’s “L’Ermitage” Brut Anderson Valley remains my favorite vintage California sparkler — at less than half the price. I was a huge fan of the Ravenswood Monte Rosso Zinfandel over the years, and when the winery lost access to that famed Sonoma County vineyard’s grapes, I went into a little bit of mourning. Thank goodness we discovered their Cooke Vineyard Zinfandel last year. While the 2008 isn’t quite as awesome as the amazing 2007 version of the same wine, it is still jammy and spicy, complex yet easy finishing, and pretty much everything you’d want in a zin — except, perhaps, readily available (they only sell at the winery and through their club, and only 300 or so cases of the 2008 were produced). If you want/need something special from Ravenswood that you could actually find in the store, all of the single vineyard designates are quite good, but the 2007 “Old Hill” was easily my favorite of the bunch. Tags: Brunello, Domaine Carneros, Fattoria dei Barbi, Gaetano D'Aquino, pinot noir, Ravenswood, Roederer Estate, Sea Smoke, zinfandel. Bookmark the permalink. Oh, I so LOVE the SeaSmoke too!